Getting locked out of your car is no fun, especially because no one ever actually plans for that to happen. Did you drop your keys in the trunk while you were grabbing groceries? Or maybe they fell out of your bag and are sitting there on the front seat, in plain view but unreachable. When this happens, no matter what time of day or night, you need help quickly, and you need someone you can trust. But auto locksmith services go beyond those accidental key mishaps. Here are a few more services you may not have known your local auto locksmith can provide. That’s right, you don’t have to spend hours at your car dealership on a Saturday just because your electronic key fob stopped working. At Rocket Locksmith, our knowledgeable team has the skill necessary to do more than replace the batteries in the fob. If replacing the batteries doesn’t work, our technicians will do what they can to get your transponder back to perfect working order quickly. Most auto locksmiths can even make new car keys and transponder keys if you need a replacement, and we don’t charge the same sort of “branding surcharge” prices you’ll see when you take that work to your dealership. Sometimes, a little dent can make a big difference—and since your key is made up of intentional dents and divots, an unintentional dent can change everything. If you regularly have issues with your key not wanting to turn or getting stuck in the ignition, stop living with that frustration just because you don’t have the hours to spend at your local dealership. Call up the Rocket Locksmith team and we can send someone to rekey or repair your ignition so your key won’t get stuck any longer! Older keys and keys made with shoddy materials will occasionally just give up and snap. Hopefully it will happen when you drop your keys onto a solid surface, but more often than not, keys snap when they’re in use, either turning the ignition or locking up. If this happens while your key is in the ignition or barely poking out of your car’s lock, your key breaking can be pretty problematic. If you have issues with a car key breaking, don’t call up your dealership and pay for rush service; an auto locksmith is your best bet for getting the remainder of the key removed quickly and your lock repaired, if necessary. Being able to store your vehicle under cover every night can make a huge difference in the life of your car. Don’t park it on the street because your automatic garage door has stopped working. At Rocket Locksmith, part of our auto locksmith services includes repairing your garage door so you can keep your vehicle protected from whatever nature decides to throw out. 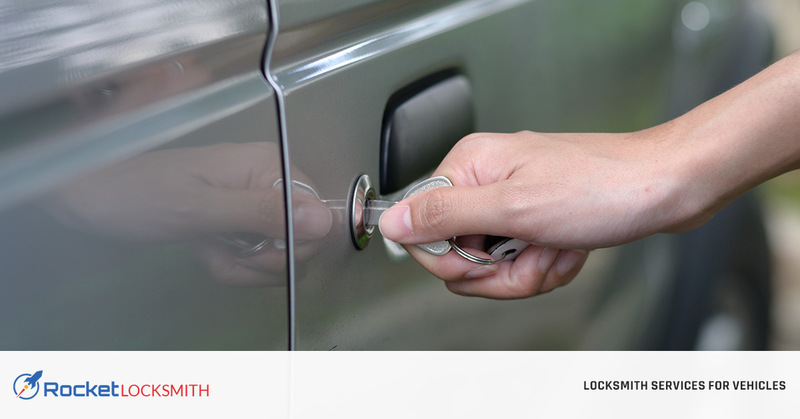 Whether you need locks replaced or your ignition repaired, if you have issues with your vehicle’s locking system, the auto locksmith team at Rocket Locksmith can get you back in your car quickly! Contact us today for car key replacement, transponder key repair, and more!